Celebrities from all over the USA performed, appeared, and gifted at NBC’s benefit concert for Hurricane Sandy victims. The hour long show was hosted by the Today show’s Matt Lauer and calls for donations were given by Jon Stewart, Tina Fey, Whoopi Goldberg, and several other notable celebrities from all walks of the entertainment industry. The solemn telethon was aired from the NBC studios in Rockefeller Center, several blocks north of where the city was stuck without power for the past week. Music acts from all over America came together in unity. 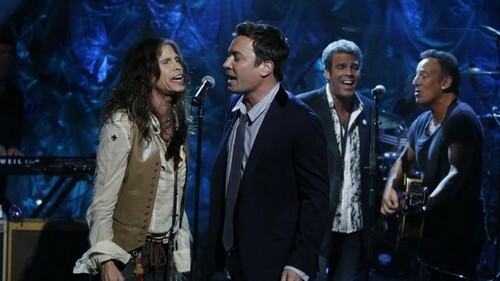 Jon Bon Jovi, Christina Aguilera, Mary J. Blige, Bruce Springsteen, Steven Tyler, and a heap of famous musicians performed their hit songs for a live television audience of millions. It was the first time that celebrities came together in such a way since Hurricane Katrina, the earthquake in Haiti, and the September 11th terrorist attacks of 2001. Songs as famous and seminal as Bon Jovi’s “Livin’ On A Prayer” were interspersed with more modern and hopeful ballads, such as Christina Aguilera’s “Beautiful”. Mary J. Blige also took to the stage with her song about spirit and optimism, from The Help’s positive soundtrack, “The Living Proof”. The hour long donations came to an end with Springsteen and the E Street Band’s influential and apt song, “Land of Hope and Dreams”. However, in the spirit of giving, several of the networks which did not wish to partake in the airing, sponsored money at their own discretion. ABC’s parent, Walt Disney Co., donated $2 million, while Viacom Inc., the parent of MTV, also pledged massive donations to the American Red Cross. We’re extremely harsh on celebrities over here at Hollywood Hiccups, especially the ones who fall off the bandwagon too often, but fortunately, once a national disaster as important and generation defining as Hurricane Sandy strikes, these celebrities seem to forget their own misfortunes, scandals, and egos at the door of entertainment fiction and fact. Katy Perry And Rihanna Are No Longer Speaking!